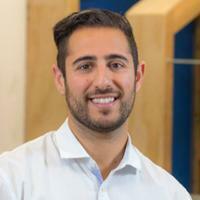 Justin Rezvani’s (’11 Marketing Management) first business was painting address numbers on curbs. Before Google Maps or Navigation, the 15-year-old would sway unsure customers by asking how emergency vehicles would quickly find the house without clear numbers to help. Although the entrepreneurial spirit emerged early, his propensity to make products appealing is why his ventures succeed. It’s also why Forbes Magazine included Rezvani on its 2017 “30 Under 30” list for young innovators redefining marketing and advertising. While at Cal Poly Pomona’s College of Business Administration, Rezvani was exceptionally involved in extracurricular activities within the CBA. He revived the college’s American Marketing Association chapter and co-founded theAmplify with engineering alumnus Jeff Weintraub two years after graduation. At the center of theAmplify is a proprietary algorithm for measuring and discovering social media audiences. Rezvani then pairs major corporations with targeted audiences during advertising and branding campaigns. theAmplify was making headlines less than a year in existence with magazines like Ad Week featuring the budding company. In April 2016, You & Mr. Jones spent an undisclosed amount for a majority stake as news of the acquisition warranted an article in The Wall Street Journal. The CBA family would collectively like to congratulate Justin on his latest accolade.